Please note, admissions to our events are on a first come first serve basis. Please at least 25 minutes early as space is limited. First developmental stage reading of Broken Words: Full story, partly off book, an intimate and powerful theater experience! Written and directed by Alejandra Ramos Riera. Julia, a young woman living in Old San Juan, Puerto Rico, decides not to speak again. Encouraged by her neighbors, her mother commits Julia to a psychiatric institution. Wrestling with the ins and outs of colonialism, mental illness, and institutionalization, Julia tries to mend episodes from her past while dealing with her relationship with her mother. As the story progresses, madness becomes a puzzle, and its pieces can only be set into place by Julia, just like the broken words flowing in her chattered mind. 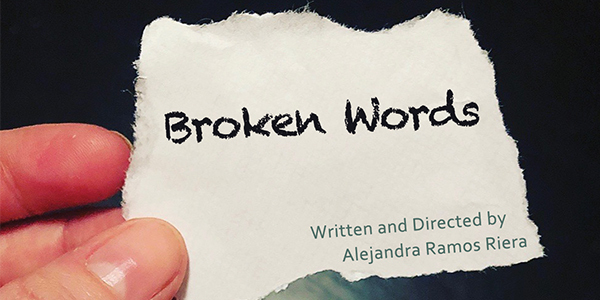 Broken Words was developed in part with support from Pregones/Puerto Rican Traveling Theater and its Step Up Artists In Residence initiative, established with support from The New York Community Trust. Alejandra Ramos Riera is a Puerto Rican playwright and director, recently relocated to New York. A much sought after theater artist, she founded the acclaimed group Teatro en la Azotea with colleague director Heriberto Feliciano Rodríguez. The company is credited for being pioneers in bringing Micro-Theater to the island. Alejandra is also the author of the book En La Azotea – 10 piezas cortas de teatro – a collection of 10 of her most popular short plays. She is currently artist in residence at Pregones PRTT under the umbrella of its Step Up Artist In Residence Initiative.